If you ask anyone to name some of the great photographers during the 1960’s and 70’s and the names of Patrick Litchfield and David Bailey would be mentioned but also would be mentioned would be Jim Lee, one of the true greats of fashion photography during this time. Quartet Books have just released the autobiography of the famous photographer that helped inspire a generation but also the next generation of fashion photographers. For someone like me who has had a very keen interest in photography since childhood and would study all forms of the art I always knew of Jim Lee so that chance to be given the opportunity to review Life in B&W was a moment I will not forget. The book has so much detail from his early memories of his parents to right to present day and packed with some of his finest work for anyone interested in fashion photography and the work behind the lens of one of the true greats and not just in photography but as a film director. Looking back at Jim Lee’s early life it was no ordinary life. A father who ended up working for MI5. Studying at an art School for a year changed Lee’s life, he was destined for something other than a desk clerk, at the age of 17 Jim waved goodbye to family and friends and set sail on the Oriana to make Australia his home. At the outbreak of the Vietnam War Lee escaped being called to serve in the army thanks to his father and returned to England. He wanted to become a film director but destiny was calling and ended up in fashion photography. Lee’s work was important as he made the women in the shoots as important as the clothes they was wearing his work is different from his peers but that is what makes Lee’s work stand out from the crowd he would say his work was iconic and stood out from others. Lee had four children from his second marriage and a son from his first marriage, sadly Orlando was killed in a car accident at the age of just 13. Then there is the story of a fake obituary after Lee suffered a heart-attack. 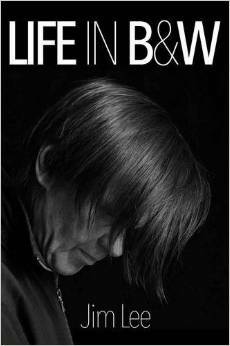 All in all Life in B&W is a glorious memoir of one of the iconic photographers and lovers of his work will cherish this book and photographs and stories held with the pages. Jim Lee (born 20 November 1945) is a London-based photographer and film director. A fashion photographer for magazines during the late sixties and seventies, he worked closely with Vogue editor-in-chief Anna Wintour in London and New York on fashion and advertising shoots. He switched to film directing in the late seventies, creating hundreds of television commercials as well as working on several full-length feature films. His earlier photographs form part of the permanent collection at the Victoria and Albert Museum, with additional photographs in the archives of The Multimedia Art Museum, Moscow. A book of his life’s work entitled Jim Lee / Arrested was launched in May 2012 alongside an exhibition of photographs from the book at Somerset House, London. Lee’s work is regularly exhibited at art galleries around the world, and he continues to collaborate on imaginative campaigns, in addition to developing his own creative projects.